Lake County Planning Director Jacob Feistner speaks at the planning board on Wednesday. The Lake County Planning Board met on Wednesday to review the growth policy that is currently being developed. LAKE COUNTY – The Lake County Density Map and Regulations are one step closer to being used as advisory documents in growth planning instead of being regulatory in the county. The documents impact land use decisions for private property. Lake County Commissioners unanimously passed a resolution of intent to repeal the county density map and regulations (otherwise known as DMRs) during a meeting on Tuesday, March 13. The vote is not final and was one of several more steps required in the process. Commissioners determined the DMRs currently guiding the county were ineffective. Commissioner Gale Decker said the DMRs “did not assist the county in meeting the goals and objectives of the 2003 growth policy.” He said the county would benefit if the documents were advisory. Public opinions on the matter were mostly split with people on one side wanting to be able to develop their land and others wanting to maintain open spaces. County Planning Director Jacob Feistner explained the history behind growth and development guidelines in the county during the meeting. He said the first guidelines were created in 1988, which is where the idea for density began. In the '90s, the county moved to a 20-acre plan for subdivisions. The Lake County Growth Policy was created in 2003 along with the density map and regulations. Feistner called it a “controversial document.” He said some people say it protects the county from unwanted growth and others see it as something that takes away wanted development. He said some of the fears people have might originate from a state law that says growth policies are not regulatory documents and don’t have any authority. He added that another state law requires governing bodies to be guided by and give consideration to the general policy and pattern of development set in the growth policy. Before he finished his presentation, he said that it was also true that if the density map and regulations are made advisory, the decisions made by the planning department won’t be the same concerning 20-acre density rules. He went on to say that if the regulations become advisory, building that one house will be allowed. However, he said, people will still be subject to density regulations if they want to develop four acre lots on a 20-acre parcel. “It will still get public review and comment,” he said. The Lake County Planning Board met on Wednesday to review the growth policy currently being developed. The planning board makes recommendations to Lake County Commissioners. The growth policy is an advisory document designed to guide growth in the county. It contains information about land use, population numbers, housing costs, natural resources, public facilities, social services, and more. County Planning Board Chairman Steve Russo said during the meeting that he had anticipated a discussion concerning the changes needed in the document and a resolution to adopt it. However, a resolution to adopt the document didn’t happen as it became clear that more work is needed before the board is ready to make a decision. 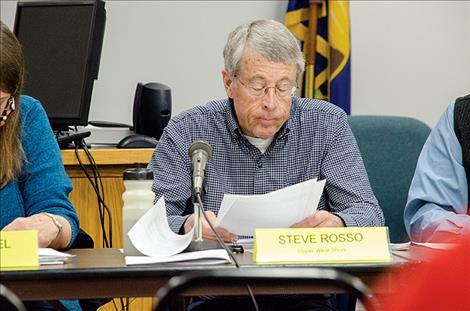 Russo said County Commissioners expressed concern about conflicts of interest pertaining to people on the planning board and the decisions they make as board members. 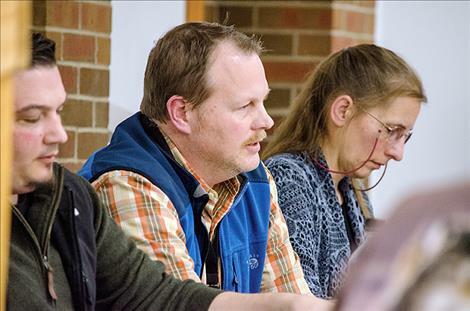 The board members present during the meeting included Russo, Frank Mutch, Lee Perrin, Abigail Feiler, John Fleming, Janet Camel, Rick Cothern, and Sigurd Jensen. 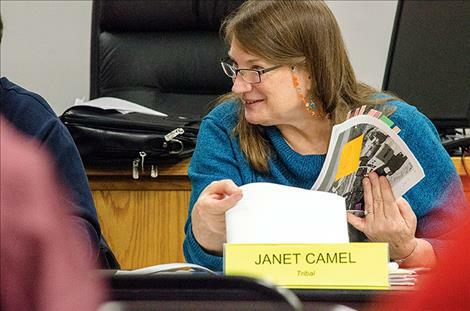 After listing pertinent credentials, all planning board members said they don’t believe anything they are involved in creates a conflict of interest with the board. Public comment was opened and the majority at this meeting was in favor of keeping the DMRs as a regulatory. A teacher from St. Ignatius said she believes the regulations protect the natural environment. She understands the need to allow growth and increase the tax base in the county. She said the school she teaches at could greatly benefit from increased revenue through taxes, but she thinks making the regulations advisory isn’t the way to go. She wants them to remain regulatory. Commissioner Decker was at the planning board meeting and he didn’t think the DMRs should be regulatory for one group and advisory for another. He was referring to land owned by individual tribal members or allotments that are not under the jurisdiction of the county’s regulations. Robert McDonald, the Confederated Salish and Kootenai Tribal Council communications director, stated after the meeting that the tribes believe keeping the DMRs as regulatory is the best way to protect homes, the environment, wildlife, clean water, open spaces, and farmland. “While we are disappointed by the County Commissioners’ unanimous vote to pass the resolution of intention to repeal the Lake County Density Map and Regulations, we maintain our strong commitment to continue working with county officials and finding a solution that makes the DMRs work for everyone in Lake County,” McDonald states. The Lake County Planning Board will hold a meeting at 7 p.m. on April 11 in the large conference room of the courthouse concerning the growth policy. Lake County Commissioners will hold a public meeting at 2 p.m. on April 24 at the courthouse in room 211 to consider public comment and the adoption of a resolution to repeal the density map and regulations.